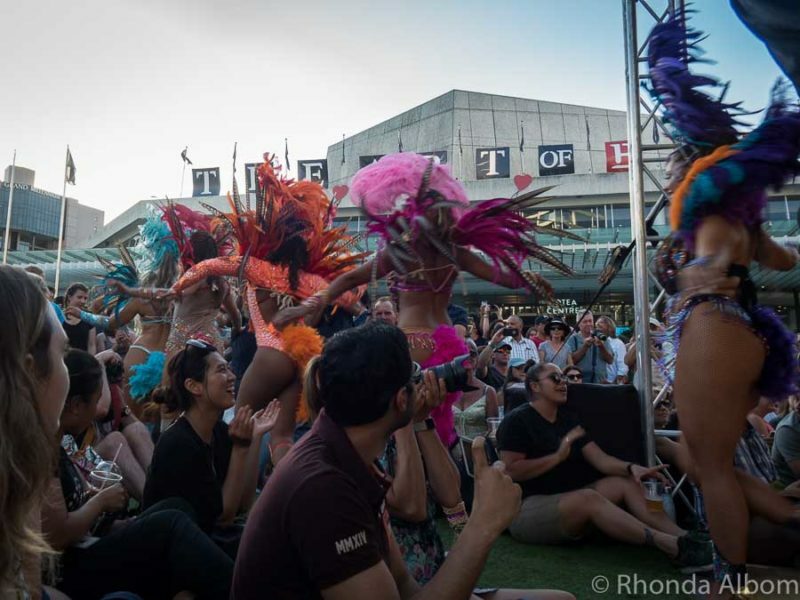 New Zealand knows how to throw a party, and that was clear yesterday at the opening of the weekend-long Latin Festival Auckland. The schedule of events at this Auckland summer fiesta weekend is varied. With two sound stages, there seemed to always be multiple options of things to do. The main dance floor alternates between a performance stage, a home for dance lessons, and an open public dance floor. And, of course, there is food. For me, the Samba Parade was a drawing card, and it did not disappoint. All eyes turned to the stage as the Brazilian dancers approached. Adorned with brightly coloured feathers, glitter, and high heels, the dancer’s samba costumes were mesmerising. Their movements were smooth and exciting at the same time. Once they finished their performance, the Samba Parade began, and the crowd joined in, before returning to the floor for open salsa dancing. Samba dancers pose for a photo before their performance. I love the bright and colourful Samba costumes, although I am pretty sure I am too old wear one. At some point, the men came out and joined the Samba dance. Samba is a Brazilian dance possibly made most famous by the Samba Parades of Carnival. The finale was a samba parade, lead by these beautiful dancers and followed by the crowd. Tempting me even before I was hungry, the aroma of Brazilain barbeque and Argentinian Asado filled the air. There were not a lot of food carts, but they seemed to cover all the favourites. If you are headed there this weekend, go hungry, as there are almost too many great choices. And I now have a new favourite food. 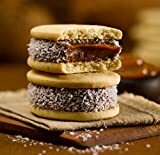 They’re called alfajores, and if you have tried it before, you know why I loved it. TIP: There is a water cooler next to the beer stand. A row of food carts offered several South American favourites including barbecue meats, empanadas, alfajores, churros, and more. I know there is a secret to South American barbecue that makes it so good. 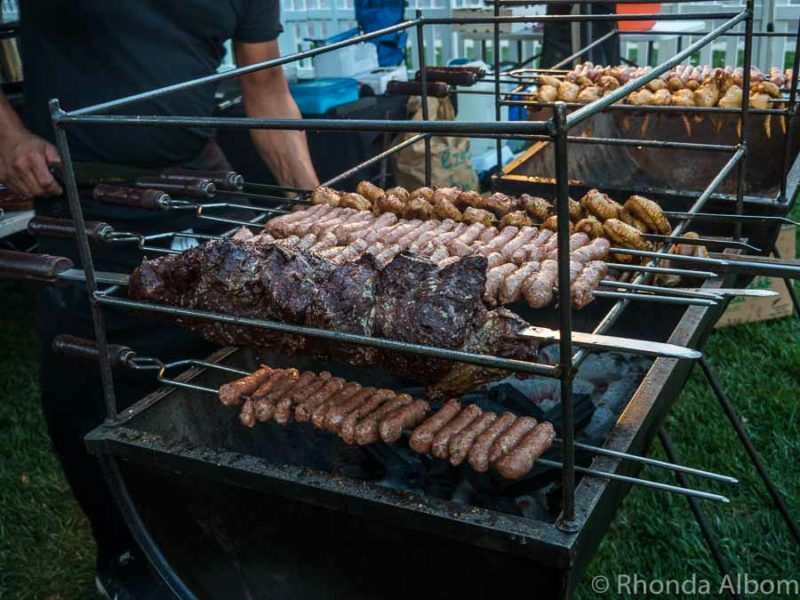 This Brazilian Barbecue was so tempting, but I opted for a delicious empanada at the next food cart. Sarah’s face lit up when she saw alfajores. They are one of her favourite sweets from her year as an exchange student in Argentina. We tried the three different flavours. Naturally, the dark chocolate was my favourite. Filled with dulce de leche, it is a treat not to be missed. 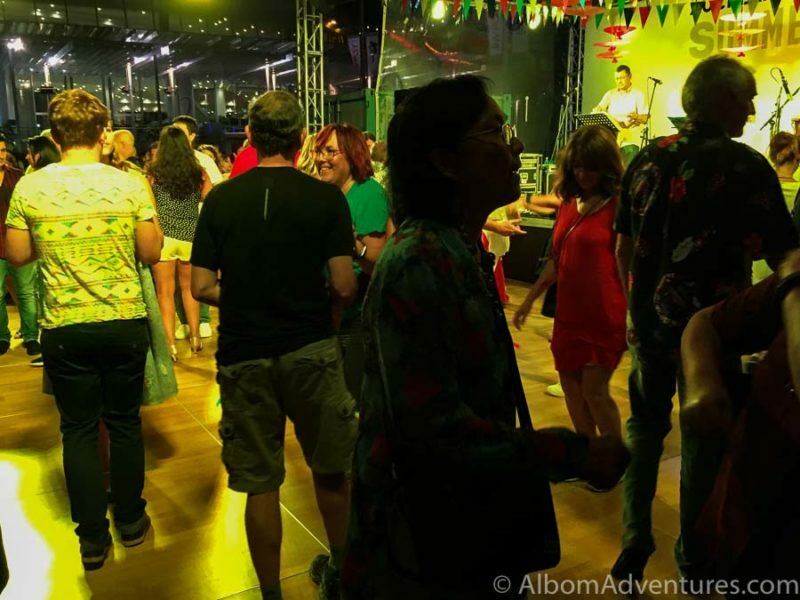 After countless songs played and the crowd danced, the floor was cleared once again for performances in capoeira, Latin music, salsa dancing, and more samba. Capoeira is so graceful to watch. 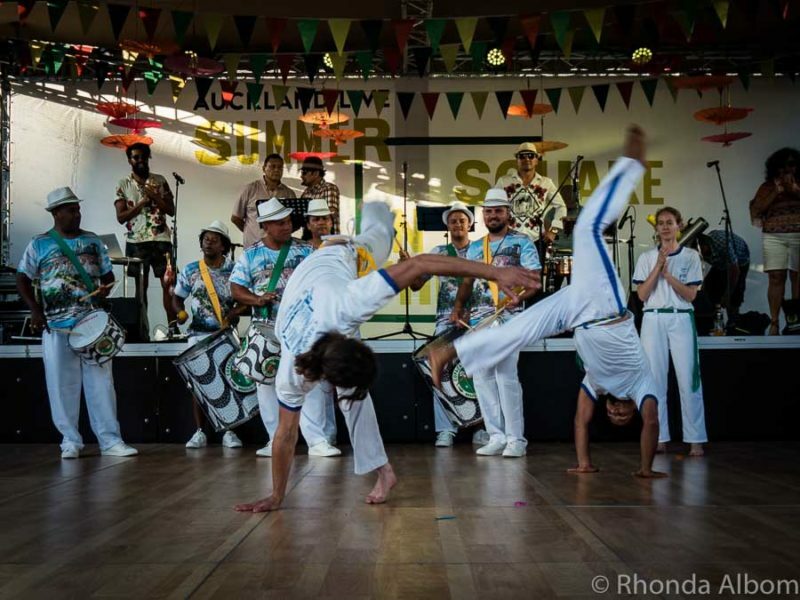 It is an Afro-Brazilian martial art that incorporates dance, acrobatics, and music. The “dancers” and the musicians are all part of the group. A second stage also featured live shows. Auckland does these events so well. An animated and fun salsa dance. One of the things I really like about Auckland events like this is that spectators just sit down around the stage and watch. Salsa with a Pacific Island twist. As darkness descended, this giant block party seemed to grow. We stayed, danced, ate, danced more, and finally went home before the festival ended at 11.30 pm. Even Jeff and I joined in the dancing. Like a giant block party, Aucklanders seemed to come out after dark. 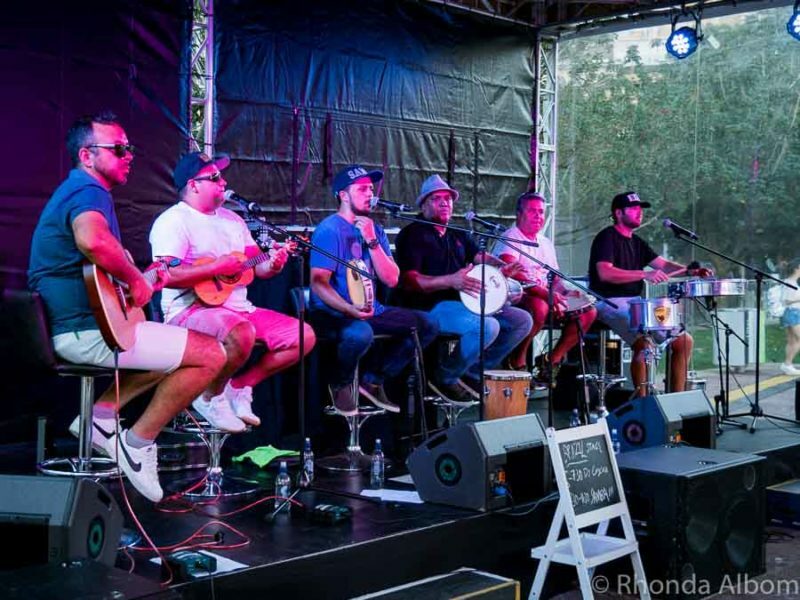 The Latin Festival is part of the Auckland Live Summer in the Square series and is free to enter. This year’s Latin fiesta began yesterday and runs through tomorrow, Jan 14, 2018. The schedule for this 2018 Auckland summer event can be found here. 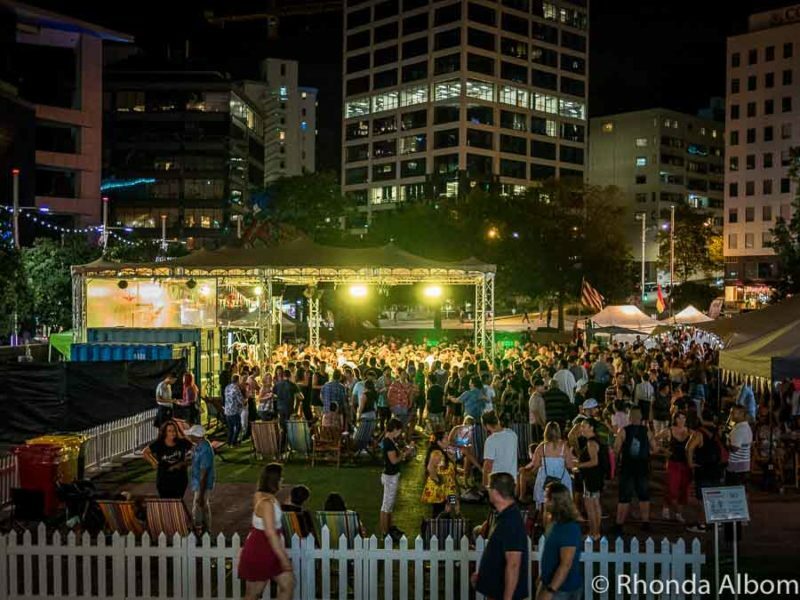 Located in Aotea Square, the event has dancing lessons, open dancing, games and activities for children, lounge chairs for relaxing, shaded areas, sunny areas, two sound stages, food carts, and plenty of fun. 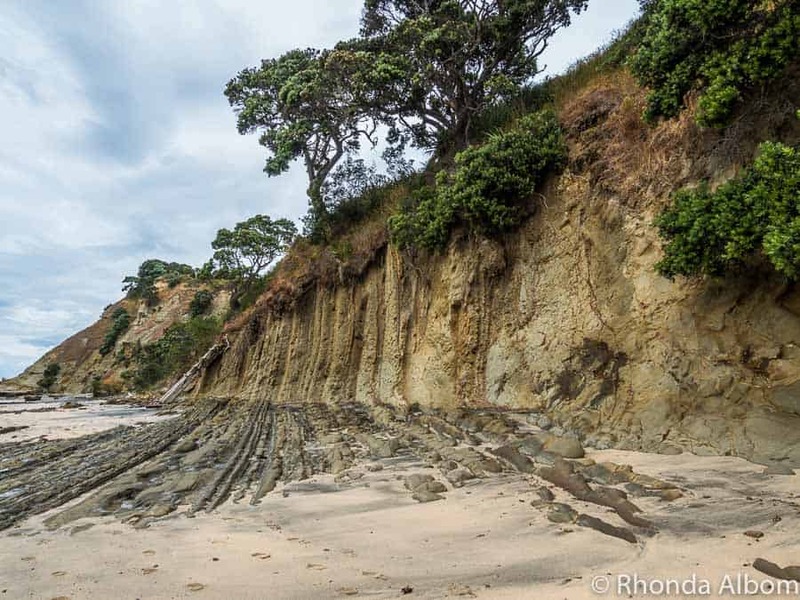 don’t miss this list of over 75 free and nearly free things to in Auckland. 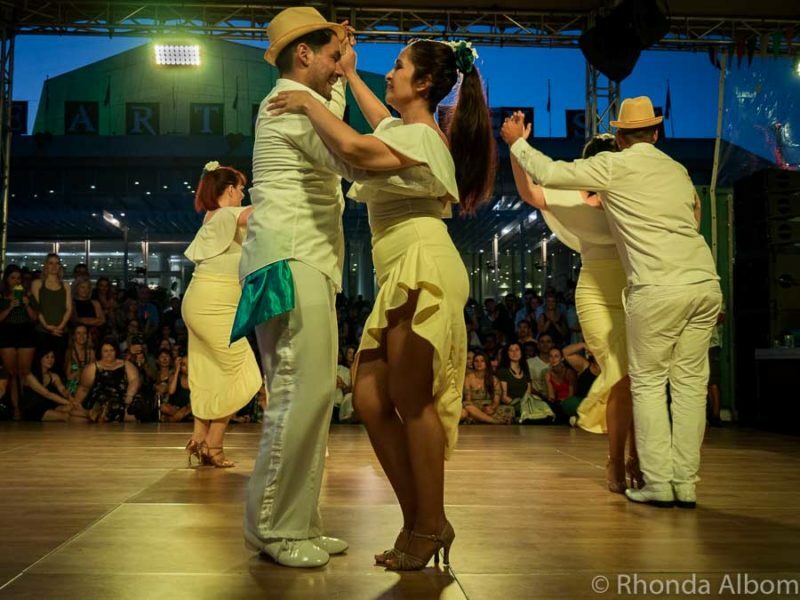 Will you visit the Latin Festival Auckland for Brazilian dancing, Argentinian food, dance lessons, to enjoy the music, or just to people watch? Such a festive event! Look at all those colors…I love Latin parties! Rhonda the festival, costumes and food look amazing. I definitely would love to attend. I’ve never heard of it before! I missed this festival, I have been there in Auckland in summer but due to work, I can’t attend the fest. Thank you for sharing this wonderful post. Looks like a fun day with lots of energy. I would love to try some of the barbecue. Wow, what a wonderful time and great pics. Thanks for sharing this festival. Hopefully, one day I will be able to go. Love the photos looks like loads of fun and ten times better than our Notting Hill Carnival all the colours and dancing plus the lovely food plus the live shows, brilliant. Latinos do know how to party! I went to carnival in Brazil a couple of years ago which was great fun, and the samba costumes are all gorgeous – although I wouldn’t dare wear one either! Alfajores are sooooo good, I would just stick around the food stalls I think – although I do love a salsa too! Sometimes countries lives more in other countries. Nice reportage. I like that. Wow..splendid pics,there must have been a lot of fun. This looks like a fantastic event and one I’d like to see too. They certainly have amazing costumes, and the food yum! 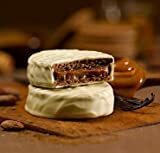 I’d love to try a alfajores. I think I’d like the dark chocolate one too. It looks great fun – but I think I’d be a bit prudish about the Samba dancers. This festival looks awesome!! The colorful, gorgeous samba dancers and all that delicious food! Now I’ve got a mean craving for Brazilian BBQ, and I really want to try alfajores! 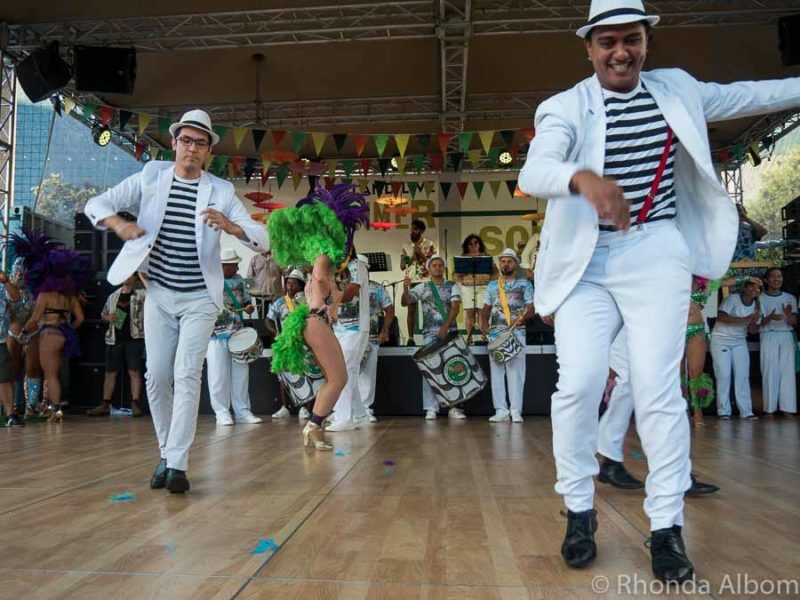 A Rio style carnival in Auckland. Who would have thought!! This is amazing, enjoyed your photos and the write-up. The colors are so vibrant! I love all the blues and aquas in the costumes. I can almost hear the lively music! What fun! What an amazing festival, we are heading to New Zealand later this year and I can’t wait to see all that Auckland has to offer. Oo la la. Now I loved seeing all the lovely ladies in their colorful skimpy outfits but the foods is what made me raring to go. That sweet goodie that you had in your hand looked interesting. What are the different types that are there. Well since I can’t get those goodies that you are showing us, I’m going to have to go into my freezer to get some. See ya Rhonda. Actually, in the states, you might have an easier time finding alfajores. The one in the photo is dark chocolate. The more traditional is similar to shortbread, while the third flavor haad a sweet white coating. Have you ever looked? This was not the first year of this festival, but I had no idea it existed before last week. I love how NZ embraces different cultures. 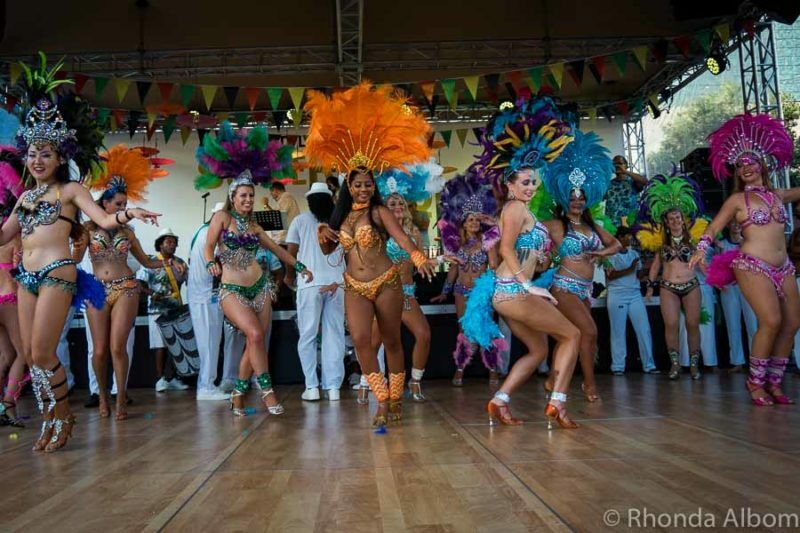 The Samba Parade looked like it was a real treat – all those costumes and that unadulterated fun! I bet it had the audience dancing! 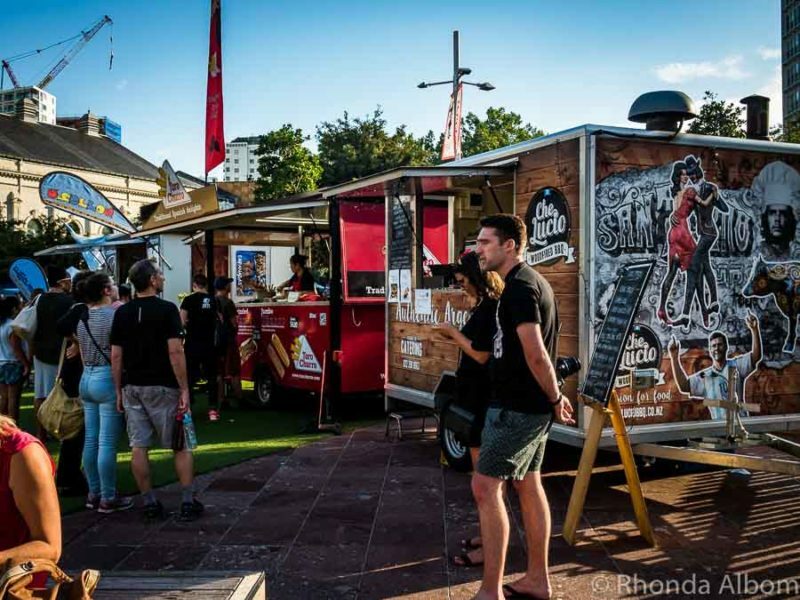 I love Brazilian food, so the food trucks would’ve been my favourite part of this festival! The alfajores looks simply divine… and that Brazilian barbecue – YUM! The alfajores are divine. Clearly my new favourite food. I just don’t know where to find them now that the festival is over. Oh wow, I did not know that Auckland had a Latin Festival it looks so colourful and fun. I’m living in Bay of Islands at the moment so will definitely check it out next year. The food stalls looked yum too. It’s part of Summer in the Square and put on by Auckland Live. Wow, music, food and lots of dancing, didn’t know that the Brazilian festivity could also be seen in Auckland! There are also a few Latin American restaurants that feature the BBQ meats. We have three favourites, two are Argentinian, the other Colombian. Really not what I’d expect that you could experience in Auckland. Looks like a fun time was had by all! Auckland is quite a melting pot of cultures. 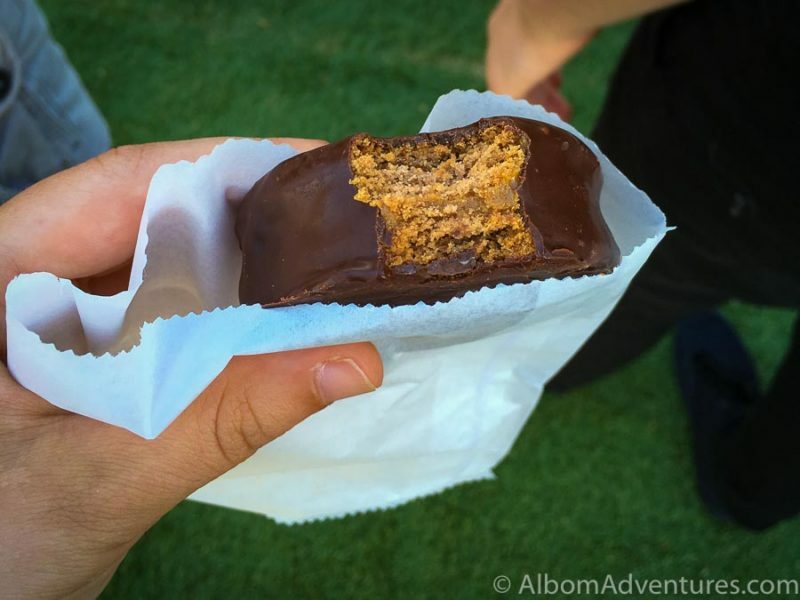 Churros are pretty good, but those alfajores are a real treat. I hadn’t heard of the latin festival but it looks like so much fun! 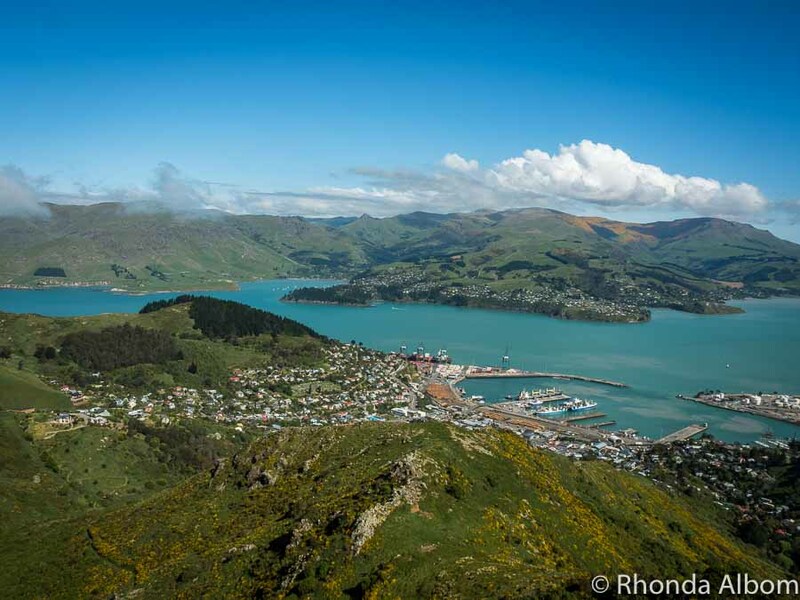 I really can’t wait to visit NZ full stop! At the moment we are in Australia so we are getting closer!! Australia and New Zealand are very different. I hope you get here someday. I didn’t know they were outside of Brazil either, but apparently, they have similar celebrations in many cities. Wow, the Samba dancers look so lovely. DId you click a video of the dance – would love to see that? Liked the graffiti on the food truck or is it the water cooler you are referring to? Festival looks like meeting of the two worlds. I don’t do video. No particular reason, but I only shoot stills. I can tell you that it was impressive. As for the food trucks, the “graffiti” is permanent images and the water cooler is not in the photo. What a fantastic event! I love the colours and the costumes that are worn by the Brazilian dancers are dazzling. I can imagine it would have been a fun festival or should I say carnivale. I am not even sure how those giant head pieces don’t throw off their balance. I don’t think I could walk with one, let alone dance. Aukland would have been the last place where I expected to see a Latin Festival. How nice! There doesn’t seem to be a shortage of entertainment in Aukland. I love Sambas and Bossa Novas, so I would have enjoyed watching those dancers. I’m sure this must have been a lot of fun, but I hope to see the real thing someday. Brazil is high on my travel list. I will challenge your response, I am sure you can think of a few places that would be less likely to host this festival. On a more serious note, my daughter is fluent in Spanish. She attends a bi-weekly Spanish conversation meet up. It’s made me more aware of the Latin population here. 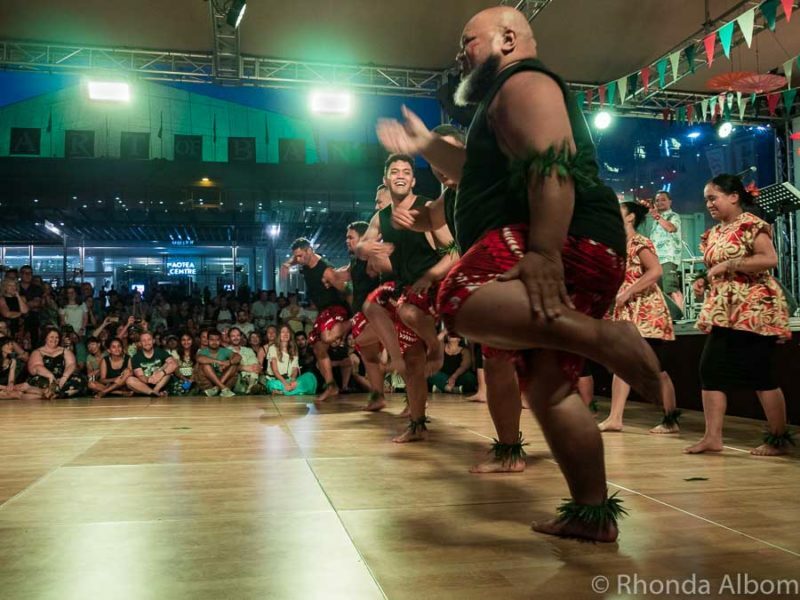 It looks like a wonderful idea to celebrate Brazilian dance festival in New Zealand. I am sure it would encourage more people to visit the real thing. Best wishes for a travel filled year! Thanks Nisha. We are headed to South America at the end of the year. I can’t wait. oh I love it! I think the bright colours appeal to me the most. Such an interesting culture. I found the bright colours almost hypnotic. I couldn’t stop staring. LOL – I love your description of our jiggles, and I agree, it is the passion and time that makes the BBQ so good. That would be so much fun to see – and participate in. You are correct, both watching and dancing (and of course, eating) were fun. Love all the colors. Great shots as always. I’d be at the food carts. Love festival food. Food carts often have the best food. I like how those dancers are all realistically shaped. Good for them. Seems like a fun day! It’s very New Zealand, it seems anyone can do anything here. We don’t seem to have the same hang-ups on body size that seemed so prevalent when I lived in the states. OOh this looks like a fun festival!! Would love to see a Samba parade! I’ve seen the Tango and Samba dance in Argentina/Brazil and it was absolutely amazing! And those costumes are just awesome! Happy New Year! It was so much fun, even more than I thought it would be.